The OM Shoppe: Have You Had Your Zeolites Today? Have You Had Your Zeolites Today? Zeolites are a natural substance found in volcanic rock and are an excellent option for detox products that can quickly filter out and remove loads of toxins from your body, especially heavy metals. Zeolites are naturally occurring mineral substances that form out of the chemical reaction between volcanic glass and salt water, according to The Abbey Newsletter. 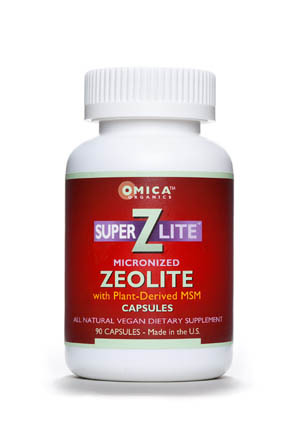 The Memorial Sloan-Kettering Cancer Center reports zeolites typically contain silicon, hydrated aluminum and sodium compounds, with some varieties also containing magnesium and calcium. Zeolites have the components and porous structure that give it three attractive properties (1). Those properties are ion exchange, catalysis and absorption. As you probably remember from high school science, ions can be positively or negatively charged due to an extra electron or the lack of an electron. Positively charged ions can freely travel in and out of the zeolite’s porous structure, making it possible for fluids around a zeolite to trade the positive ions with the positive ions of the zeolite. A prime example of a useful ion exchange in action comes from sodium zeolite A (2). This particular zeolite, an extrinsic zeolite powder, can remove water hardness ions from the surrounding fluids, making it useful for laundry detergents and other cleaning products. Those same ion exchange abilities can help with a detox flush in your body. That’s because toxins carry a positive charge, which zeolites can naturally capture without affecting the beneficial, negatively charged minerals and nutrients your body wants and needs. Even though zeolites can take centuries to form naturally, they are good at speeding up other chemical reactions. Body detox does not need to be a long, drawn-out process and zeolites help ensure it isn't. Their catalyst abilities help speed up your body’s natural processes without affecting the process itself and without the need for additives to do so. Zeolites are highly useful for absorption, once again due to their porous structures and their abilities to attract positive ions. This gives zeolites the ability to act as a kind of sieve, where they can filter out specific, unwanted substances while allowing others to remain intact. Unwanted substances can include anything from bacteria to the wide load of environmental toxins that like to seep into your body over the years. Zeolites can purge them out while leaving your body’s essential minerals and nutrients in. The ability to absorb, filter and remove toxins is where zeolites’ top benefits for detox come into play. A study available through DovePress wanted to find out if zeolites were effective for purging the body of long-term buildups of heavy metals, which can often contribute to a variety of chronic conditions and illnesses. While chelation therapy and other methods have been options for body detox, their side effects can be unpleasant and their effectiveness can be uncertain. Certain detox supplements or detox capsules may also result in a non-selective flushing out of the system, resulting in the loss of essential electrolytes. None of that was the case with zeolites. After study participants took a daily dose of a commercially available zeolite supplement, the study showed a marked decrease in heavy metals found in participants’ body. The study also found the zeolite supplement did not affect electrolyte levels, leaving them to do their necessary duties in the body. Although the study focused on heavy metal buildup, zeolites look at other types toxins as fair game. This includes the aforementioned bacteria and wide range of environmental toxins best known for disrupting your hormones and damaging your nervous system. It also includes fungus and viruses. With the removal of all those hazardous and disruptive substances, detox can leave you feeling lighter, sleeping better and thinking more clearly. It can increase your energy levels while decreasing the burden on your kidneys, liver and other organs that normally perform detoxification functions. One more benefit of zeolites for body detox is their wide availability. You don’t have to go out and scoop up volcanic ash to reap the benefits. You can instead find zeolites in a variety of forms. These include zeolite capsules, extrinsic zeolite powder or a liquid zeolite supplement. You can also find a number of different product brands, such as Zeotrex, which has the added benefit of Fulvic Acid to aid in body detox, and SuperZLite, which is enhanced with Non-Petroleum Derived MSM . I use the capsules and they work great. It is amazing how much better you feel and the clarity you gain when you detox the junk from your body! Thanks so much for useful info.